Subplots By Grace: Tooting My Horn! HOW IS EVERYONE? I hope you're doing well. Would a little horn-tooting offend you all? I know it's kind of annoying when people wax eloquently about how awesome they are. So mindful of that, I'll try to keep my awesomeness in check and just repeat the accolades I've been receiving since my memoir REACHING hit the market. Thank you to each person who visits my blog. Your friendship and support make me smile. Talk about awesome...it's all of YOU! It's the writing that will keep you coming back for more in this memoir. Grace uses her observations of nature, her descriptions of family and friends, her unique "take" on childhood events, her dreams -- all to draw her into her world, see life through her eyes, and want to help her brake free. An amazing read, truly. -- Laura. [Grace] tackles uncomfortable topics with poise, but does not hide from them. A beautiful read that reminds us both how frail humans can be and how much we can overcome. -- Julie. In this memoir vivid details of both events and perceptions create a fast-moving emotional train, hard to step from until it stops--a unique, breathtaking story, told so well and so intimately that the reader is helpless to do anything but turn the next page. It's a book I will never forget. -- Linnie. Grace's story is very interesting, and she tells the story in a very engaging way. Without parental nurturing, we could all be tempted to follow a reckless path. --Everhopeful. In telling her story of abuse and the subsequent emotional nightmare in such a compelling way, Peterson will touch readers, including those have experienced abuse themselves. Her own journey to healing will inspire and give hope to others who struggle with a past that seems to sentence them to a life of pain. In her book, Peterson writes of "reaching" for healing, for rescue, for love. With her book, she is also "reaching" out to others who are looking for the same things. -- Tina. I received the book in the mail on Friday. I finished the last 20 pages Sunday morning. You guys, it was SO GOOD. It was heart-breaking, and horribly sad, but it's so beautifully written. I loved reading it. I was in a hurry to finish it, but at the same time, I didn't want it to end. -- Mindy. Go ahead and toot, friend. That is a fabulous review of your book. My current post I kind a toot my own horn too. You go, girl. That's awesome. What a good feeling it must be to read such amazing things about something you've created. 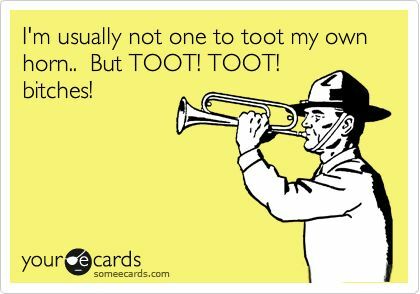 Toot, toot, away. I believe under these circumstances tooting your horn is allowed. What an awesome set of reviews, Grace! So happy for you. Savor ever last word and toot!